Start by adding quinoa to a dry skillet set over medium heat and shake it constantly until you start to hear small pops. Keep mixing quinoa until it is all popped. It takes only 3-4 minutes after the first few pops for the process to be complete. Then remove the popped quinoa from the heat. Let it cool before mixing it with the rest of the ingredients on our list. Mix all well and spoon the combination into molds to set in refrigerator for four hours. Or place the bites in the freezer for one hour of quick-setting. Remove them from the molds and keep the bites in an airtight container in refrigerator for up to 7 days. Peanut Butter Donuts, Chocolate Covered! What lands a food on the “no-no list”? The answer to this question depends on who is asking and more importantly who is answering. There are hundreds (if not thousands) of diets that include a list of foods to avoid. Most diet plans rely on such lists to ensure success. If you are a person following the plan and can’t avoid chocolate- covered candies for example, the plan will likely fail. . Taking a hard line and excluding a variety of food groups amount to the main downfall of a multitude of diet plans and fads marketed today. Over the years, one truth still stands: balance is the key to healthy living. And that just not only applies to talking about food, but overall, as in when individuals are able to work and still take time off for vacation, to eat healthy meals but still enjoy chocolate in moderation – then they are able to maintain that lifestyle in the long run. Let’s answer the question we first posed at the beginning of this post (if you haven’t noticed, at times it’s easy to get lost in thoughts and get off subject when writing about food and health!). Usually a food that is high in sugar or fried has too much salt or no nutritive value ends up on the “don’t eat” list. But we take that as a challenge! Instead of prohibiting these foods, let’s swap a few ingredients and revamp the recipes , so that it becomes something we can enjoy every once in a while without guilt. You will see many posts to follow with this in mind, and I would love some suggestions from you for foods or recipes you’d like to see revamped. First on the list is my husband’s favorite: donuts. The poor guy had to say goodbye to the sweet deep fried rings when he said “I do” to a nutritionist. Although we still indulge in the traditional donut a couple of times of year, that hasn’t been enough for him. Thankfully, adding nutrients to donuts wasn’t extremely difficult. Donuts lack protein, but adding peanut butter to the dough significantly increased this recipe’s protein content. For a better ratio of macronutrients, a slight decrease in sugar does the trick. The main issue of concern with donuts is the deep frying: the saturated and trans fats that result from this process may be extremely harmful to heart health. But the good news is that baking a donut is pretty easy with a donut pan. They are available in either silicone or non-stick steel- like materials. Of course the texture of a fried donut will not be exactly the same as a baked donut, but when you crave a donut and are trying to stick to a better healthy-eating plan, these will do the trick! The sugar was reduced in this recipe to just ½ cup; for a sweeter version add another ½ cup of sugar and increase the milk to ½ cup. The dough will be very sticky, so using some non-stick spray really helps. ? Try: What should be the next recipe that we make over? Combine peanut butter (Make sure it is soft. 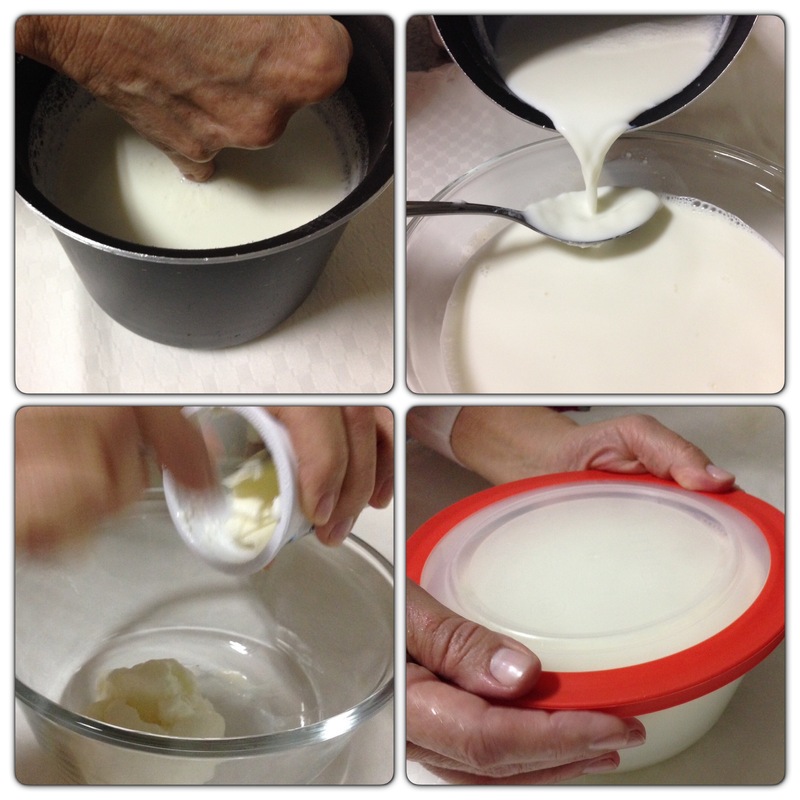 If stored in the refrigerator, take it out for 20 minutes to soften), sour cream, milk and vanilla. Mix well, then add in the beaten egg. Next, add in the sugar and mix it well. Lastly mix in the flour and baking powder. The mixture will be thick and sticky. Spoon into donut molds and place a preheated oven at 350F for 8 to 10 minutes or until baked through. Melt dark chocolate chips and dip one side of the donuts into the melted chocolate. Decorate the donuts with a peanut butter drizzle and enjoy! This recipe makes 12 mini-donuts. Take the wrapped dish to your “holding” space. This space needs to be somewhere without ventilation, a place that will maintain the warm temperature. You may use a microwave, a corner in your pantry, a crockpot, or my personal favorite, the oven. Of course all those devices, including the oven will be off! It is just a safe place where your yogurt won’t be disturbed and have time to rest while staying sufficiently warm .. A minimum of 8 hours is recommended to complete this process, but you can l let it incubate up to 12 hours. The longer you wait, the thicker your yogurt will be. 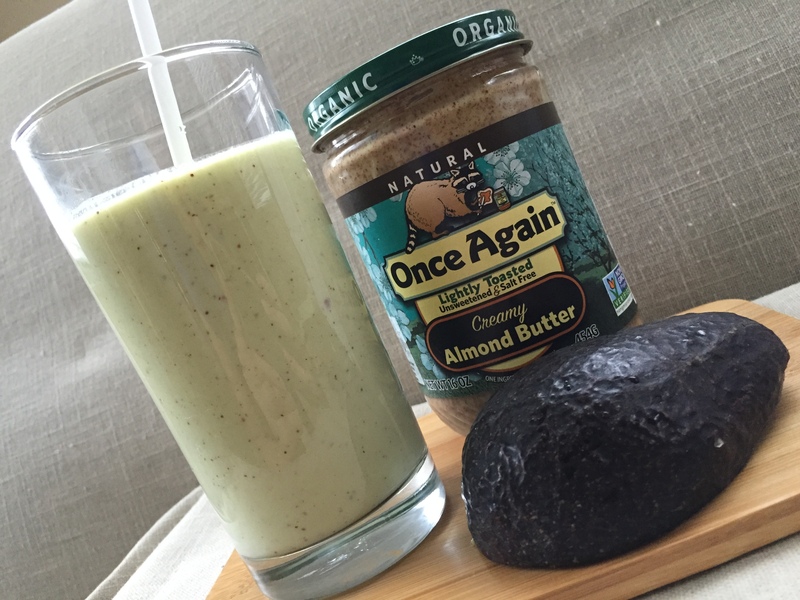 Avocado Shake: What happens when you combine avocado with Once Again! Americans’ love affair with the avocado may have started off with guacamole, but it has evolved into much more than just adoring it as a dip for chips! Nowadays, you can find avocados as an ingredient in appetizers, entrees and desserts. But should you be invested in a long- term relationship with avocados for your health? All that in just 160 calories! Avocados have scared some away because of their high fat content, but that should not stop you from enjoying them. The fat in avocados is mostly monounsaturated fatty acids, mainly oleic acid, which is beneficial for reducing inflammation, among providing other benefits . Avocados are naturally cholesterol-l free and also contain small amounts of magnesium, manganese, copper, iron, zinc, phosphorus, and vitamins A, B1, B2 and B3! And don’t forget fiber too; in just one serving, there are 7 grams of it! This combination of antioxidants and anti-inflammatory components is what makes the avocado a super fruit able to combat cancers, lower cholesterol, boost heart health and help with weight loss. Avocados also aid in the absorption of fat- soluble vitamins such as vitamin A, K, D and E; therefore, enjoying avocados mixed with Once Again Nut Butters is a win-win! Go ahead and slice them up, and add them to your sandwiches and wraps! Smash them and use them as a spread instead of mayo. Since avocados are high in fat, they are also perfect for baking, adding to smoothies, making ice cream and so much more! Looking for an avocado recipe to add to your menu? This one is so simple that you can make it in the morning faster than toast. Blend together and enjoy! Use the other half of the avocado to make a second batch to freeze in popsicle molds for a late afternoon snack. 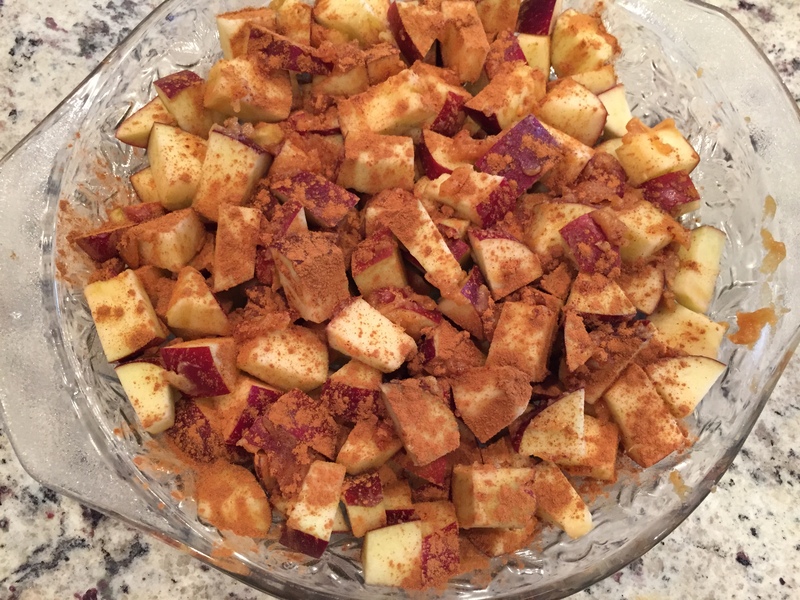 How to make a Peanut Butter Apple Crisp the easy and healthier way! “An apple a day will keep the doctor .” Who came up with that saying anyway? My research (done out of curiosity) yielded some interesting results! The phrase is from Wales, and it’s a variation from the original, a Pembrokeshire proverb: “Eat an apple on going to bed, and you’ll keep the doctor from earning his bread.” The apple being an international symbol for health, combines here its properties as antioxidant, fiber and nutrient rich fruit with the fact that it was used as a “teeth cleaning” tool, since eating it would help remove all other stickier foods from their teeth and gum line. Too much info? Perhaps, but it’s interesting to find out that the silly things we say can sometimes have much deeper meanings. With all of its shining qualities in mind, let’s get to our recipe: Peanut Butter Apple Crisp! Apples are an excellent choice to include in your daily diet, and they are versatile; you can enjoy them in so many different ways. Simply washing and eating them is the favorite of many, but slicing them up and smothering them in peanut butter is a close second. I use pureed apples in baked goods to add sweetness and moisture. As a matter of fact, many people substitute applesauce in equal parts in recipes that call for oil and achieve healthier results without compromising taste and texture. 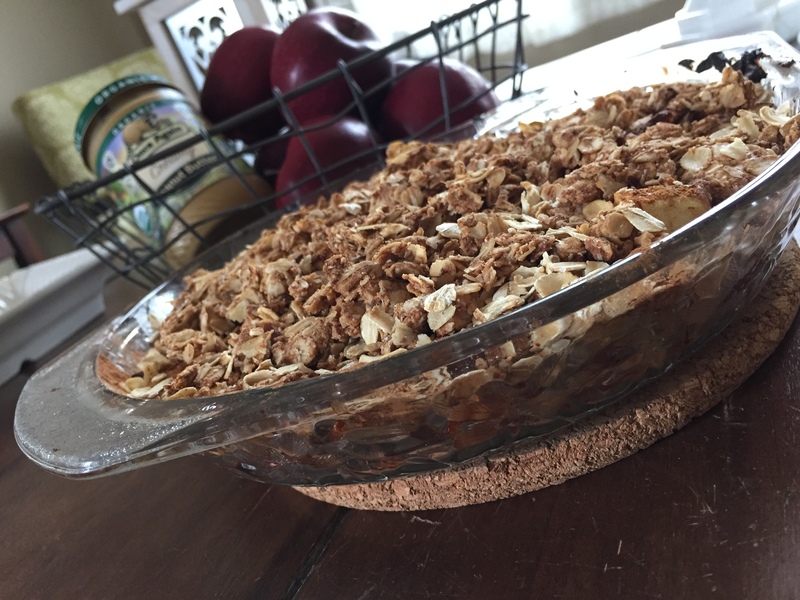 The Peanut Butter Apple Crisp recipe can be made in a pie dish to serve several people, or even in individual baking dish for single servings! It only takes minutes to prepare before going in the oven, and the ingredients are likely ones you stock in your pantry. Warning: you may be tempted to make this recipe tonight, and we highly recommend that you give into those feelings and enjoy a nice healthy bowl of it and share your review with us. Below you’ll find the recipe for the larger batch — as well as a reduced recipe for just one serving. If you make the larger batch and don’t devour the entire pan at once (when warm out of the oven with a nice scoop of ice cream), it makes a great topping for yogurt the next morning! 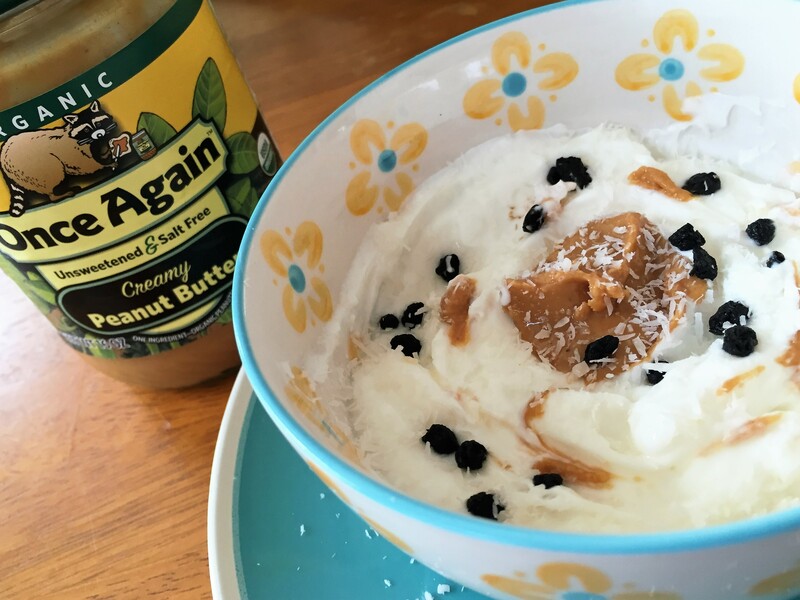 Start by mixing the 4 tbsps of Once Again Creamy Peanut Butter with the juice of 1 lemon. If you’re peanut butter was refrigerated, then first warm it up in saucepan for just a few minutes, this makes it much easier to mix in the lemon juice. Now add cinnamon and stir well. Fold in the apples until they are well coated in the mixture. Place it in a baking dish and sprinkle a little extra cinnamon on top. For the crumb, in a small bowl mix the 2 tbsp Once Again Creamy Peanut Butter with oats, forming a crumbly mixture. There will be larger chunks in it, and that is what makes it so good! Add cinnamon and mix it in the crumb. Now top the apple mixture in the baking dish with the crumb mixture and bake for 45 minutes at 350F. Enjoy it warm! Or place it in covered dish and save it in refrigerator for up to 3 days. 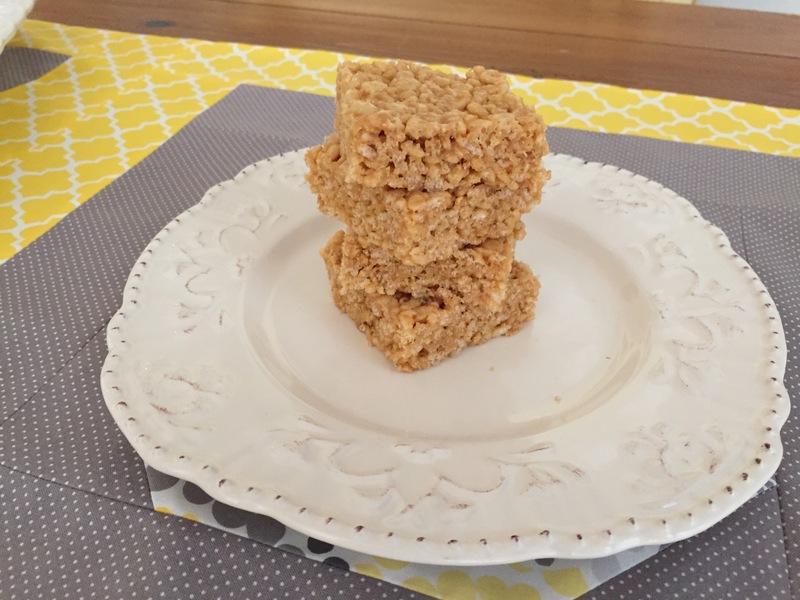 Playtime in the Kitchen: Peanut Butter Crispy Recipe! No matter how old you are, all it takes is one bite of a Peanut Butter Crispy treat to bring the biggest smile to your face! Something about the combination of crunchy and sweetness results in an inexplicable nostalgic feeling of happy childhood times. The traditional treat recipe includes loads of marshmallow melted at low heat, which although a simple step, always resulted in burned pans and a sticky mess in my kitchen. So why not solve two issues at once? No more burned pans and another treat satisfying my insatiable craving for peanut butter! Use equal parts of Once Again Crunchy Peanut Butter (you can use the creamy too!) and honey for the perfect mixture to pour over the crispy rice cereal. Let it cool for a few minutes, and cut the mixture into squares, or use cookie cutters and get creative. This recipe is a fun way to invite kids into the kitchen. They can handle the mixing step all on their own, spreading the mixture into the pan and pressing it down with a spatula. These are simple steps that can boost their self-esteem and spark their interest in cooking. Most traditional holidays are associated with family time in the kitchen, but baking cookies can be a time challenge; however, these Peanut Butter Crispy treats can be made in 20 minutes from start to finish! And no baking skills are required. Take it to the next level, by adding dried fruit and nuts to the mixture for a more gourmet- like treat. Sometimes I lie in bed trying to fall asleep and think about different combinations to add to my crispy treats! Seriously, I may just have to open a Gourmet Crispy Treat store one day with all sorts of different flavors. What would you think about a Peanut Butter Crispy Treat with chocolate chips and red pepper flakes? 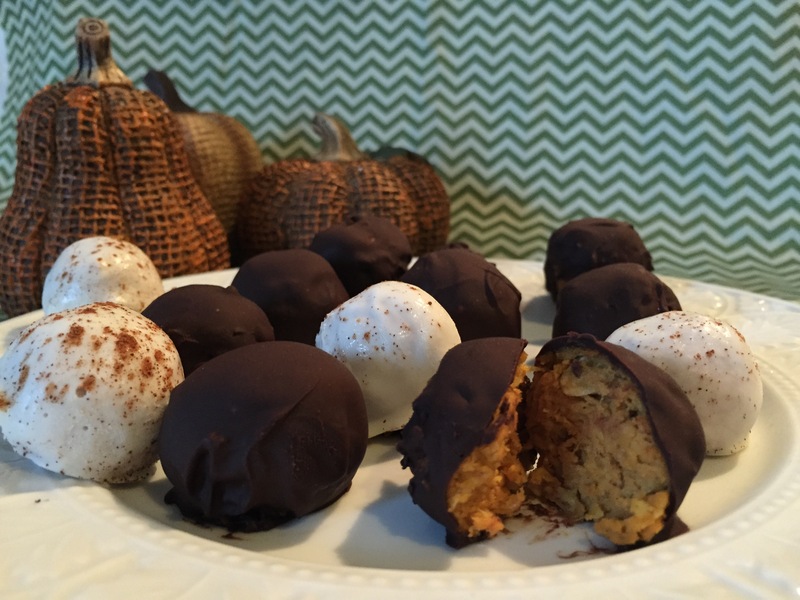 Go ahead and create your own version of a peanut butter crispy gourmet treat and please share your version with us! I promise to make at least one combo you suggest and post a photo on our Facebook page! Heat honey and crunchy peanut butter in small sauce pan. Then pour the mixture over the rice cereal and stir well. Pour the mixture into a small pan lined with waxed paper, and using a spatula press down evenly. Let is set for a few minutes before cutting. Breakfast Pumpkin Cookie: Can you have cookies for breakfast? One of my favorite things about the holidays is that eating cookies for breakfast is not only accepted but encouraged! Cookies are one of my favorite things to make and eat, I particularly like the cookies that are high in fiber and protein because they are perfect candidates for “breakfast cookies” that you can eat any day and not just on holidays! My kids are usually a bit shocked when instead of their oatmeal and bowl of fruit I present them with a plate of cookies and warm milk for breakfast. 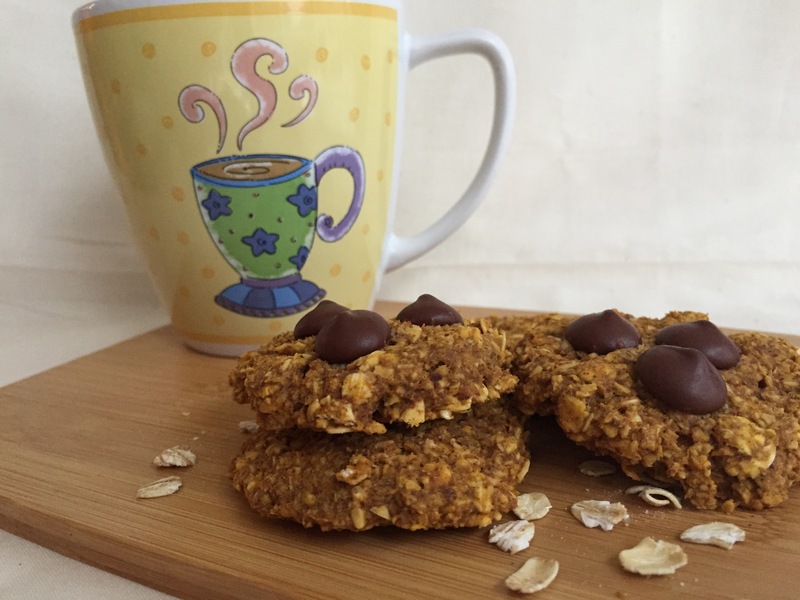 Best part is that these Breakfast Pumpkin cookies are filled with oats, (#glutenfree) pumpkin and almond butter, so they are delicious and nutritious. This recipe includes ¾ cup of pumpkin puree, since it is season for pumpkin and nutmeg. But you can actually make them with other fruit purees for some variation. I have tried it with bananas, dates and even a mix of zucchini and banana. Keep the measure at about ¾-1 cup and if you happen to be using a fruit puree that has more water than pumpkin, add some extra oats to compensate. Here is the recipe and share with us in the comments belwo how do you feel about having cookies for breakfast? Preheat oven to 350F. You can purchase the oat flour, or just make your own by adding about 1 ½ cup of oats into the food processor until you achieve a coarse flour. Then add the baking soda, pumpkin spice and salt to the flour mix. Next add the pumpkin, Once Again Almond Butter, maple syrup, vanilla extract and mix well. Lastly add the oats and mix. Using a “cookie scoop” drop dollops onto a greased cookie sheet (or one lined with a silicone baking sheet) then flatten the cookies and take to oven for 15 minutes or until golden. Makes about 24 cookies with a ½ tsp scoop.